Trent Warren at Schriever Air Force Base. Trent Warren is a senior business management major from Colorado Springs, Colorado. This summer, Trent was an intern for Lockheed Martin, a global security and aerospace company. Trent worked as a systems engineer in the Experimentation Lab (X-Lab) at the Missile Defense Agency (MDA). 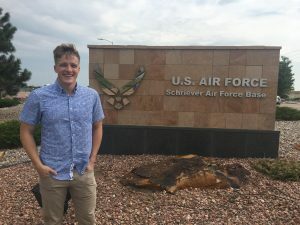 Specifically, Trent worked in control account management, space system engineering, and also participated in the Lockheed Martin summer intern project. Trent was able to grow professionally this summer because of the variety of projects he worked on and what he learned from his coworkers. He gained experience in finance, programming, and engineering because he was not limited to one type of project. He also knows that working with the brilliant people in the X-lab was key to his growth this summer. Throughout his internship, they guided Trent and challenged him to accomplish difficult but rewarding tasks. Trent’s favorite part of his internship was working in the X-Lab. He got to work on and solve new and exciting problems. Even though he was there for a short time, Trent feels as if the work he did helped those around him and, more importantly, fulfilled the mission and values of the MDA. Trent’s experience will help launch him into a promising career in systems engineering. He discovered a lot about what it means to be an engineer and how to overcome obstacles in the job. Trent plans to take the lessons he learned this summer with him for the rest of his life. 1. Push through your blockers. Whenever you get stuck on something, or whenever a task just seems too difficult to accomplish, keep attacking it from every conceivable angle. There are plenty of people that can do most of the work on a job. What makes you stand out is if you can use your resources to finish a job that no one else can figure out. 2. Write. Down. Everything. Every business has their acronyms and lingo. If you do not understand what something means in a meeting or in a conversation, write it down and ask someone later. Knowledge is power, and the first step to knowledge is writing down what you don’t know (which is usually almost everything at first). 3. Work hard for the right reason. In every business, there are people who are just working for the next promotion. Personally, I work for the people around me, for the mission of the organization, and for my God. Pick what you work for because that philosophy affects every decision you make.